With Christmas on the horizon it's time to start thinking about presents, trees, turkey and how to get out of Boxing Day at the in-laws. Of course it's also El Gordo time, with the world's BIGGEST lottery prize pool, and you can win the jackpot right here at Lottoland! Let's take a look at this gargantuan lottery from sunny Spain. 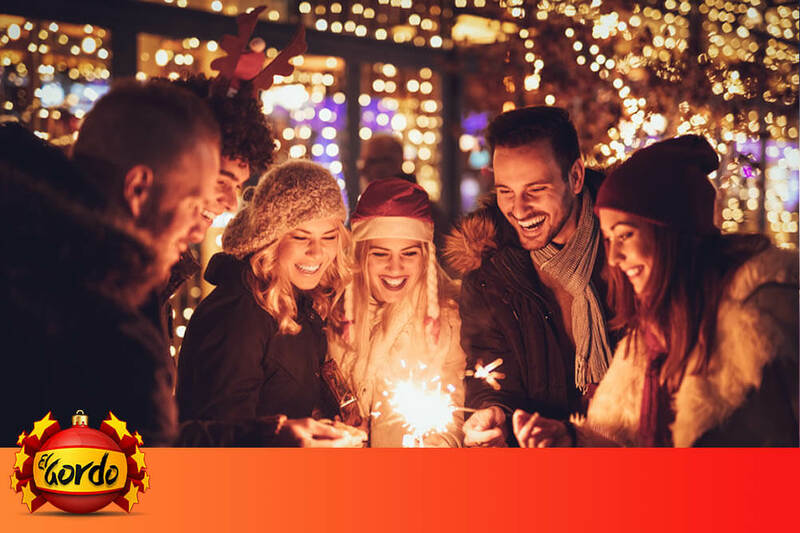 The Spanish Christmas Lottery - also known as Sorteo Extraordinario de Navidad - is the world's largest lottery draw, boasting a prize pool of £2.1 billion. It takes place once a year, on December 22nd, and you can win it here at Lottoland! What Is This Lottery Actually Called? Sorteo Extraordinario de Navidad, Lotería de Navidad, El Gordo, Spanish Christmas Lottery – well, which is it I hear you cry!? Lotería de Navidad simply translates to 'Christmas Lottery', which is usually prefixed with the word Spanish to avoid any Christmas-lottery-based confusion. El Gordo is actually the name of the top tier prize, the jackpot, and not the draw as a whole. The term El Gordo means "the fat one", the nickname being of course a reference to the massive prize pool, which stands at a world-beating £2.1 billion. The idea behind the Spanish Christmas lottery is to spread as much wealth to as many people as possible. Unlike regular lotto draws which pays one lucky winner the lion's share of the prize pool, El Gordo distributes millions to hundreds of winners. The top prize, "El Gordo", is worth approximately £3.5 million, and there are 17 different prize tiers in total. 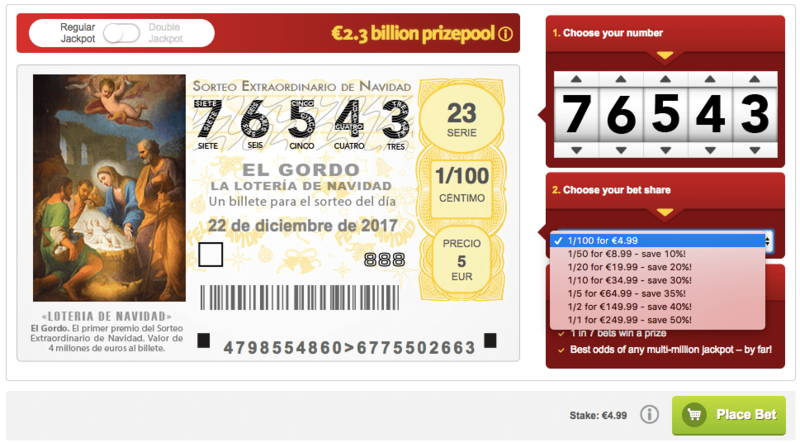 Another way in which the Spanish Christmas Lottery sets itself apart from other lotteries is its format, which is more like an old school raffle, rather than a lottery draw. In the main draw, lines are sold with different numbers, with each line consisting of five digits. They are printed in series of hundreds. So say you have a ticket number 12345, there would also be dozens other people with the exact same numbers as you – and potentially you could all win a big prize! A full bet line would cost you a whopping £249.99, which is why in Spain people tend to club together and buy 1/10 of a line each, which are called decimos. Not only does it split the cost, but it also means you have the chance to win together. This is why you often hear stories of multiple winners living in the same town or village, or whole families banking the big prize. Traditionally betting on the Spanish Christmas Lottery was for residents of España only, but luckily, times have changed. Here at Lottoland we offer the best and biggest international lotteries, and that includes the gigantic Spanish 'El Gordo'. Entry via Lottoland is a little different to the standard way of taking part, so I'll explain exactly how to bet with us. Get yourself over to our Spanish Christmas Lottery page. Select which numbers you want to bet with: a sequence of 5 numbers from 0-9. Choose which bet share you want from the 7 different options. Then it's time to sit back and join the rest of Spain to wait for the magical Christmas Lottery draw on December 22nd. In 2015 Christmas came early for one lucky Lottolander, who banked a cool £3 million betting on the draw with us. The winner, (who decided to remain anonymous), was hunting around online for ways to bet on the El Gordo jackpot outside of Spain. After finding Lottoland, he clubbed together with his wife and friends to create their own mini syndicate, and to buy a full ticket for El Gordo. He told us: "I like that it's a classic, raffle-style lottery. I like the passion and pageantry that goes along with it. Best of all, of course, is that £2.1 billion prize pool – that's just incredible really. When I got the win notification I had butterflies in my stomach. I simply could not believe it." Despite starting 2016 as a millionaire our El Gordo winner wasn't about to launch himself into a life of excess, insisting his celebration party would be, "Nothing too dramatic". Although, as a keen cyclist, his eyes did light up when he told us about his plans to splash out on an expensive new bike. Just like Christmas, El Gordo only comes along once a year. With a prize pool of over £2.1 billion you could join this list of El Gordo winners and have a very merry Christmas. Head to our Spanish Christmas Lottery page to bet now!